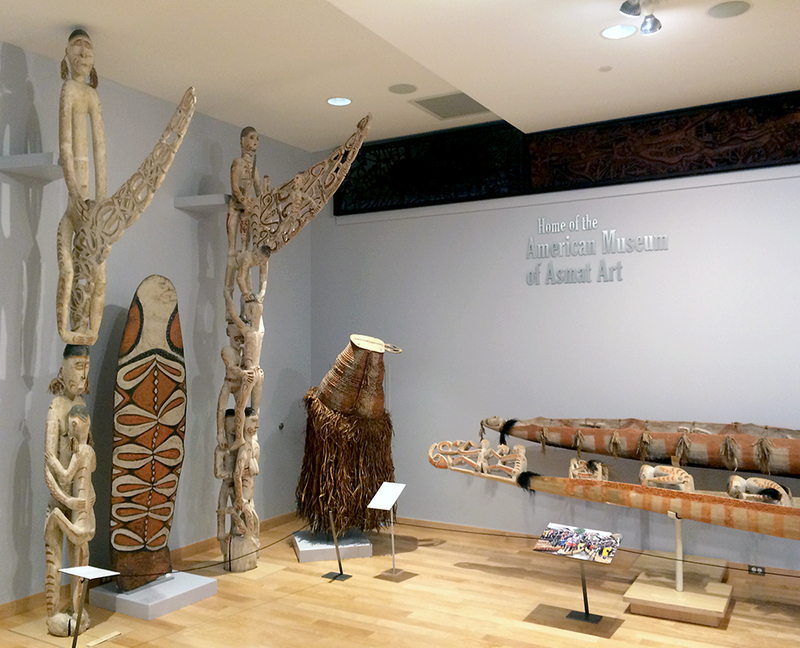 The American Museum of Asmat Art at the University of St. Thomas (AMAA@UST) is an integral part of the University of St. Thomas in Minnesota. It is dedicated to the art and culture of the Asmat people, who live on the southwest coast of the island of New Guinea, which is situated directly north of Australia in the southwest Pacific Ocean. The AMAA@UST has one of the largest collection of Asmat art in the country, with more than 2,200 objects. Most of the works date from the mid 20th century to the present. The collection originally was formed by missionaries from the Crosier Fathers and Brothers, a Catholic religious Order, who worked in the Asmat region beginning in 1958. The museum had two previous homes in Hastings, Nebraska and Shoreview, Minnesota. In 2007, the Crosiers, wishing to place the collection in a setting where it would be used to educate students and the public about Asmat art and culture, gave it to the University of St. Thomas. The museum's Gallery, located on the second floor of the Anderson Student Center on the university's St. Paul cmpus opened in 2012. The Gallery is divided into two sections: a permanent section, which displays Asmat ancestor poles (bis), canoes, and other large-scale works and a temporary exhibition section, which present regularly changing exhibitions on different aspects of Asmat art and culture using works drawn from the collection. The museum’s collection continues to grow and the AMAA@UST forms an integral part of the university’s broader commitment to fostering respect and appreciation for cultural diversity and the artistic achievements of all of humanity and of the Department of Art History’s dedication to teaching global arts in context. A view of The Gallery. Photo by Eric Kjellgren, Sept. 26, 2014. View of The Gallery's changing exhibition space, Photo by Eric Kjellgren, Sept, 26, 2014.